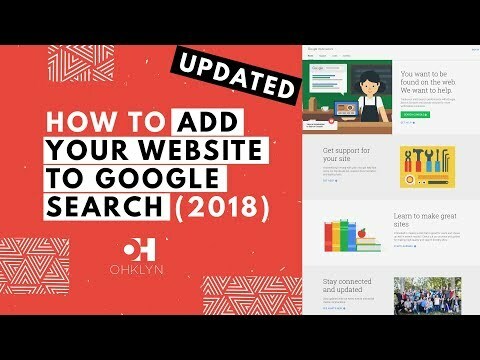 How to Add Website to Google Search (2018) | WordPress Yoast SEO + Google Search Console [NEW] "
In this video, we'll show you how to add your website to Google Search. there's a few simple things you need to do in order to make sure people can find it. show you how to do it. So, let's get to it. be in the description below). any links mentioned in this video. using the Yoast SEO plugin and Google Search Console. Ensure the Googlebot can access the pages of your website that you want to be indexed. This relates to your robots.txt file. If you're a WordPress user, this is really easy and we'll show you how to do this shortly. Submit your sitemap via Google Search Console, and request Google to crawl your website. Firstly, enabling the Googlebot to crawl your website via WordPress is really easy to do. This will update your robot.txt file and allow Google to crawl your website. plugin, and generate your sitemap. Yoast SEO is a free WordPress plugin that we recommend for all users. In this case, we'll use it to create your sitemap. for WordPress and is regularly updated to stay current with the latest developments. To learn more about the Yoast SEO plugin, follow this button on the OHKLYN post. From your WordPress Dashboard, hover over 'Plugins' and select 'Add New'. You will be taken to the WordPress plugin repository. To find the Yoast SEO plugin, search for 'Yoast SEO' via the search bar. The Yoast SEO plugin will be among the top results. when the theme was last updated, and if it's compatible with your version of WordPress. In this case, these all look good. Then click the 'install' button to install the plugin. When the plugin is installed, select 'Activate' to activate the plugin. Hover over the newly created SEO tab in the admin menu and select 'General'. From there, navigate to the to the 'Content Types' tab. Here is where you'll select the contents of your site that you want to index. For most people, you will only want to index pages, and posts. that you DON'T want indexed. as access the knowledge base. Then click on 'Save changes'. Now that that's done, go back to the 'General' option in the Yoast SEO menu. Go to the 'Features' tab and scroll down to the XML sitemap entry. which will open a new browser tab with your sitemap. to crawl your website or blog. This tool will also help you manage any crawl, 404, or other errors related to your site. Head over to the Google Webmasters Search Console. If you're following along on the OHKLYN blog, you can follow this button here. You will need to log in to your Google account first to access it. from the address bar and paste it into the text field in the middle of the screen. Then click on the 'ADD A PROPERTY' button. You will then be asked to verify the ownership of the domain. Select the 'Alternate Methods' tab and click on the 'HTML tag' option. A meta name tag will now appear on the screen. Select the whole tag and copy it. Navigate to the 'Webmasters tools' tab. You are now presented with three text fields. approach by taking the meta tag from their respective Webmasters tools. everything is good up to this point. Now, click on the 'ADD/TEST SITEMAP' button. Hopefully, you kept that sitemap URL you copied earlier handy. You should be asked to reload the page. Once you do that, there should be a new sitemap entry waiting for you. In the menu on the left, under Crawl, navigate to 'Fetch as Google'. Then hit the 'FETCH AND RENDER' button. It might take a while to complete. Once it finishes you should be presented with a 'Partial' or 'Completed' status. Click the 'Request indexing' button next to it. A window should pop up asking you to confirm you are not a robot. Select the 'Crawl this URL and its direct links' option. for URL and linked pages'. You have successfully submitted your site to be indexed by Google. Please leave a comment and tell us if you found this guide useful. We hope this brings you another step closer to creating your perfect website. for more videos related to WordPress, digital marketing and how to run a successful website.